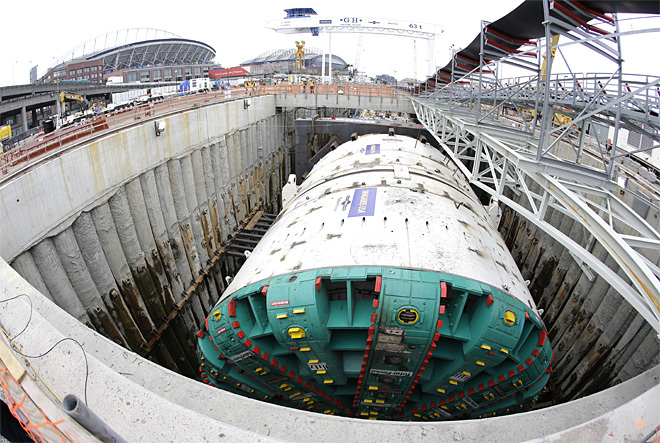 SEATTLE — Bertha, Seattle’s tunnel-boring machine, is officially stuck. According to a spokesperson with the Washington Department of Transportation, the giant drill hit some kind of obstruction and can’t move through it or past it. WSDOT says the trouble started Friday when Bertha’s five-story tall cutter head felt some resistance, then stopped. WSDOT says engineers with Seattle Tunnel Partners, the company in charge of building the viaduct replacement tunnel, have been consulting with other experts to identify the obstruction – whether it’s natural or manmade. They say Bertha wasn’t damaged in any way. They’re keeping her idle until they decide whether crews need to dig the obstruction out from above or if Bertha can charge through it. Bertha has dug 1,000 feet of tunnel since July. She’s sitting 60-feet underground between South Jackson Street and South Main Street among a mix of native dirt and fill tossed into place from as early as the 1800s. She has just 450 more feet to travel before leaving that fill behind. It will also mark the end of phase one in the $4 billion tunnel project that will stretch 1.7 miles from adjacent to Safeco Field to Battery Street. WSDOT doesn’t know how long Bertha will remain stuck, but they say it’s too early to say whether the delay will affect the project’s bottom line or it’s scheduled opening in late 2015.